Maximize IU’s full capacity for research, scholarship, and creative activity that is recognized as excellent through national and international peer comparisons. Indiana University is a national leader in research, a long-standing member of the select Association of American Universities, and the home of scholars of outstanding international recognition. 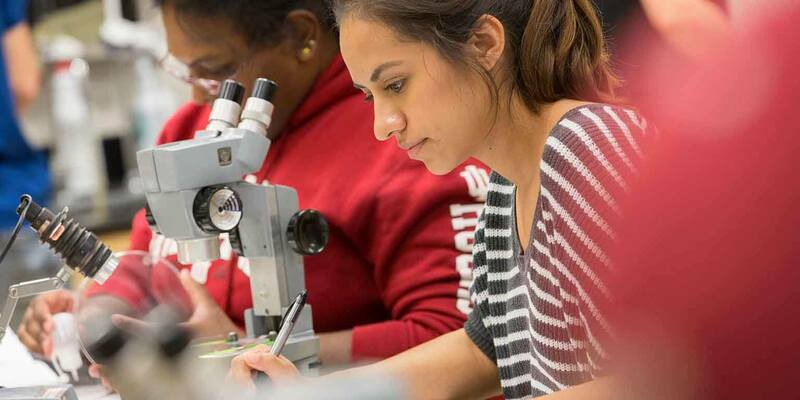 Like all great research universities, it draws strength from the breadth of its activities: although there are selected areas of particular focus, its essence is a gathering of scholars from across all disciplines and creative fields, providing a rich environment for faculty and students alike. The benefits to the people of Indiana from having great research universities in the state are profound. It is well documented that university research and creative activities are associated with increased growth and incomes in their surrounding regions through students who have received their education in a research-rich environment; through new enterprises and new ideas brought into existing businesses; through a pervasive culture of innovation; and through openness to new ideas in applied science, business, the professions, the nonprofit and public sectors, and in the creative industries. Although there are great opportunities to be seized in the coming years, the environment for research universities is increasingly competitive and challenging. The past few decades have seen a significant increase in the research activity and reputation of universities around the globe. The United States has traditionally been far and away the leading home of the world’s great research institutions, but universities around the world have been rising in what have become ubiquitous international rankings of universities. In many ways, the globalization of university research is a great benefit. Just as findings generated by IU faculty benefit researchers internationally, so are we able to build upon international scholarship. But it also implies a healthy but increasingly intense competition for scholarly and creative talent, and for funding and recognition. IU must rise to meet this challenge. Nationally as well, there is increased competition for scarce funds from public agencies and foundations, with success rates for grant proposals to some agencies falling to below 10%. Hence, it is essential that Indiana University take an active and vigorous role in supporting faculty and graduate students in achieving success in securing grant funding. Research and scholarship fundamentally rely on the inventiveness, innovation, and creativity of the individual investigator or scholar, yet research has become increasingly multidisciplinary and based on teams of investigators. The funding of research across the humanities and social and natural sciences has shifted in the direction of team-based research focused on major and large-scale problems, and away from the solitary investigator. These major and large-scale problems—often called grand challenges—are chosen because of their potential to advance a discipline or address some major problems of humanity and because they can only be addressed by multidisciplinary teams of the best researchers. First, IU faculty and academic administrators must take the lead in identifying grand challenges where IU has the greatest potential to make the most significant contributions. Faculty will be invited to identify major issues facing society and possible means of searching for solutions through teams of scholars. Second, IU faculty and academic administrators must take the lead in assembling teams and clusters of researchers most able to address these grand challenge problems. Third, the university must provide support to catalyze faculty efforts to seek major long-term grants and gifts to fund their work in attacking these grand challenges. Fourth, select hires and appointments should be made, including cluster hires of senior scholars and their research groups who have outstanding records of funded research to lead or greatly strengthen research efforts focused on these problems. Fifth, IU must work to remove barriers to collaboration that might exist between researchers in different schools and campuses to maximize the ability to form teams and clusters of investigators. The future success of IU’s research enterprise will depend on such institution-wide collaboration. The environment that has just been described applies to research in the life, health, physical, social, and technological sciences, as well as in the humanities. In the arts, the emphasis remains primarily on the individual creative artist or scholar, though of course music and theatre are almost always based on the performances of groups of artists, often with dynamic and complex facilities and equipment. The arts are an enormous strength of Indiana University. 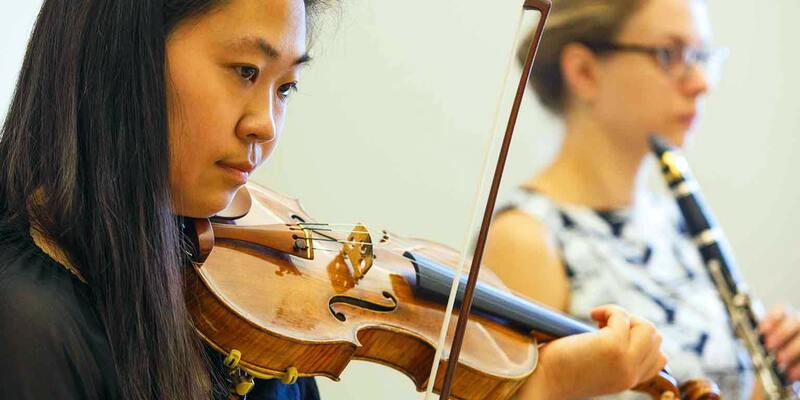 The Jacobs School of Music in Bloomington is consistently ranked among the best in the world. The programs in studio art and design at the Herron School of Art and Design in Indianapolis, at what is expected to be the new School of Art, Architecture + Design in Bloomington (see Bicentennial Priority Eight), and in vibrant programs in these areas on the regional campuses, such as the Raclin School of the Arts at IU South Bend, are all highly regarded, as is the Department of Theatre, Drama, and Contemporary Dance in Bloomington. For nearly a decade, the work of creative artists and scholars of the arts and humanities have seen their work supported by New Frontiers in the Arts and Humanities, one of the most generous funding programs for humanities and the arts at any university. New Frontiers has funded hundreds of successful projects on all of IU’s campuses—literary works, experimental works in new media, works of art, and new musical compositions and performances. Many of these successful projects have gone on to further recognition, including receiving additional funding for their development. It is no exaggeration to say that the last decade has been a golden age for support of these disciplines at IU, despite a general environment in higher education that too often ignores or marginalizes this part of the core of a liberal education. IU will ask faculty and academic leadership to identify the grand challenges to which IU can contribute most effectively, building on strengths in the humanities, professions, and social, natural, and clinical sciences. IU will support multidisciplinary and multicampus teams to address those grand challenges. IU will continue to support the arts and humanities through the New Frontiers in the Arts and Humanities program. IU will also continue to invest in facilities to support the creative and performance activities of these disciplines. IU will continue its support of widespread intercampus collaboration by establishing a searchable faculty collaboration database to identify opportunities. This database will also assist in establishing the faculty networks envisioned in Bicentennial Priority Two. IU will intensively pursue cluster hires to strengthen current areas or establish new strengths. These will focus on experienced faculty members with track records of research accomplishment, success in securing funding support, and serving as catalysts who enable others within or outside of their disciplines to excel. IU will provide targeted seed funding and support for faculty in expanding and diversifying sources of external research funding. IU will continue to invest in the physical and IT infrastructure necessary for twenty-first century research and beyond, through new and renovated laboratory space and continuing investments in cyberinfrastructure, with priorities based upon prospects for research productivity. Of vital importance to the future of Indiana are robust Schools of Education on all of IU’s campuses. They have the leading role in the state in training teachers and school administrators, and in producing innovative research on teacher training, pedagogy, curriculum, and administration. The central importance to the people of Indiana of having an effective P–12 system—a system of early childhood, elementary, and secondary education—cannot be overstated. It is essential for Indiana’s economic, social, and cultural development, and for the quest for equal opportunity and socioeconomic mobility. Indiana University takes tremendous, justified pride in its graduates, who teach more of Indiana’s sons and daughters, especially in public school systems, than any other university in the state. Frequent winners of state and national awards, IU Education alumni serve Indiana with distinction and build the educational foundation for the future. The state and IU face serious challenges in the field of education. Although Indiana ranks highly among states in terms of high school graduation attainment, questions remain regarding the college-readiness of graduates, as indicated by rates of college completion that are below national averages. Educational policy is itself in flux, as it so often is, as state governments wrestle with questions of teacher and school accountability, appropriate metrics of learning success, funding, and administrative structures, and the reward and retention in schools of top educators. Partly as a result of such controversies, and partly due to shifting economic opportunities, enrollments in degree programs in IU’s Schools of Education have been on a significant downward trend, with undergraduate and graduate enrollment declining by around 30% over the last few years, despite the high quality of the programs. This is in turn causing severe financial strain on all campuses, and the situation is simply unsustainable. Given the importance of P–12 education to the state, and with IU’s commitment to outstanding professional education and research that forms part of Principle of Excellence Three, it is essential that Indiana University’s faculty and academic leadership look deeply and comprehensively into how its Schools of Education can best serve the needs of the educational system in Indiana and Hoosier students, the needs of individuals who wish to pursue a career in education, and the needs of education across the nation and the globe. Doing so can also address serious enrollment declines in Indiana and nationally. IU will not only advance its responsibility for leadership in education in Indiana, but will also attract new and talented students who are excited to take on the problems of P–12 education and want to be part of the solutions. The review must represent a thorough, university-wide reevaluation—in full accordance with IU’s traditions of shared governance—of education programs, degrees, non-degree credentials, and multidisciplinary collaborations; student experience, including clinical experiences; and engagement with P–12 school systems throughout the state of Indiana; and if warranted, the structure and organization of education at IU. To assist in such a review, IU will establish a Blue Ribbon Review Committee of external experts and practitioners to provide an external perspective on developments and trends in teacher education and education research. The review will inform IU’s own analysis of the future direction, approach, and structure of the Schools of Education on all campuses and how they should address their significant enrollment declines. (For the core campuses, the external review may also inform the search for new leadership of the school.) The overall internal and external process will solicit wide input from IU faculty, students, and other key constituencies. IU’s core campus School of Education and the regional campus Schools of Education (collaboratively) will undertake reviews of developments and trends in teacher education and education research, with a view to recommending new approaches, directions, programs, or structures for their respective Schools of Education, with particular attention to addressing large declines in enrollment. The core school and regional campus reviews should occur simultaneously, but should remain in contact with one another. As these reviews proceed, the President will convene a Blue Ribbon Review Committee of external experts and practitioners to react to the reviews and to present their own assessment of future directions for schools of education. IU’s Schools of Education, with campus and university leadership, will review the internal and external reports, and adopt and implement their recommendations as appropriate, in accordance with IU’s traditions of shared governance. The core campuses’ report will also inform the search for new leadership for that school.